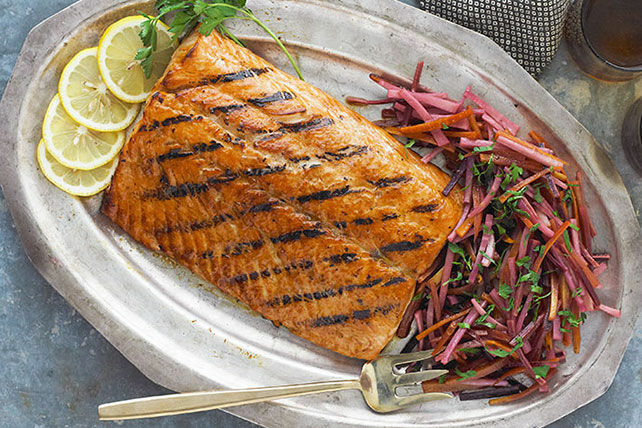 Served up with a colourful parsnip and carrot slaw, this barbecued salmon is a breeze to clean up after, thanks to the foil-pack grilling. Mix barbecue sauce and 1/4 cup honey until blended. Pour half over fish in shallow dish; turn to evenly coat both sides of fish with barbecue sauce mixture. Refrigerate 20 min. to marinate. Meanwhile, combine vegetables in large bowl. Mix dressing and remaining honey until blended. Add to vegetable mixture; mix lightly. Spoon onto centre of large sheet heavy-duty foil; fold to make packet. Grill 20 min. Remove fish from marinade; discard marinade. Place fish, skin side up, next to packet on barbecue; cook 5 min. Turn fish. Reserve half the remaining barbecue sauce mixture for later use; brush fish with remaining barbecue sauce mixture. Grill 15 min. or until fish flakes easily with fork, brushing occasionally with reserved barbecue sauce mixture. Cut slits in foil packet to release steam before opening packet. Sprinkle vegetables with parsley. Serve with fish. Serve with hot cooked brown rice. The skin will easily slide off the salmon once it is grilled.